The founder recently visited Time Inc.'s offices to chat, but was coy about whether he's been approached by private equity. (Fortune) -- Ask Michael Dell what he needs to fix at his company, and the list is long. For one, he says, the company culture could use more cojones. "There's not enough risk-taking...The attitude was to go five for five. It needs to be 8 for 10," Dell said last week when he stopped by Time Inc's offices in New York. The still-just 42-year-old founder was in town to launch a new line of products, called Vostro, targeted to small businesses. It's just one of the bets he's making to wrestle back the company's dominance of the worldwide PC market. To regain some market share among consumers, Dell (Charts, Fortune 500) is tweaking its image, starting with a new ad campaign on TV, in print, and online this month showing Inspiron laptops in eye-catching colors like pink and green, with the tag line: "Yours is here." During the interview, Fortune editor Andy Serwer asked Dell if he's been approached by any private equity firms about a potential buyout. Dell went quiet, smiled, looked to his PR person, looked back, and said, "I'm not sure how to answer that." And so, he didn't answer. But consider that the company has enormous cash flow, which every private equity firm looks for to support the debt necessary to pull off a buyout: $1 billion-plus in the fourth quarter of 2006 alone. And last year, the stock was hovering at half of what it was at the end of 2004. Still, Dell's current market cap is about $54.5 billion, so any buyout attempt would be ambitious to say the least. But buyout deals are only getting bigger. The Bell Canada buyout last month was worth $33 billion in cash plus $16 in debt, totaling $48.6 billion. In any case, Dell seems more focused these days on making acquisitions of his own, mentioning the idea several times during the discussion. The services business is the fastest growing part of the company, but still only accounts for $6 billion of Dell's total $60 billion revenue, making it an area ripe for development. Michael Dell is also banking on a fresh executive suite, with five new hires from the outside, including marketing chief Mark Jarvis from Oracle (Charts, Fortune 500), and former Motorola (Charts, Fortune 500) executive Ron Garriques, who championed the hit Razr phone early on at his last company and is now president of Dell's consumer group. Dell says he's also streamlining the company's structure at the top: instead of having 26 people working for the CEO, as it was before Dell returned at the end of January, he has reduced that number down to 12, which he says feels about right. In addition to getting back into the consumer market, Dell is reconsidering its direct-to-consumer distribution model. 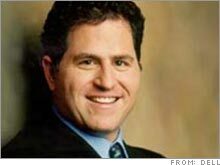 Michael Dell says the company can do both direct sales and move into stores. The company recently dipped its toe into retail sales at Wal-Mart (Charts, Fortune 500), putting two desktop models on sale. The first shipment sold out in many stores. The company's stock is already up roughly 20% since Dell started. Given Michael Dell's storyline as a founder who's returned to rekindle a company that's lost its way, it was only natural to ask whether he's talked to the man who's basically written the book on how to pull off exactly that feat. "Do you talk to Steve Jobs?" "Can you tell us what the two of you talk about?" Jobs may or may not be giving Dell any advice about how to get his company back on track, but one thing is for sure: Dell sure could use some of Apple's (Charts, Fortune 500) retail showmanship.